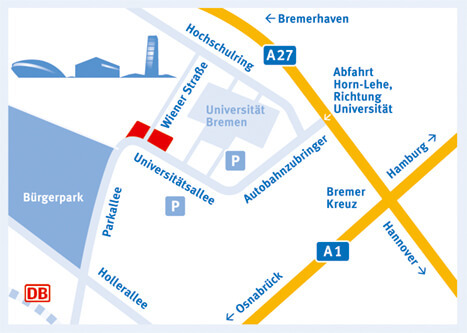 Universum® Bremen is located next to the A 27 Bremen “ Bremerhaven, and is just a 2-minute drive away from the ‘Universität’ exit. Buses can stop directly in front of the Universum® building to pick up and offload passengers, and parking spaces can be found right next to it. There are IC and ICE direct rail connections to all the main German cities, and tram line 6 (towards Universität) takes just 15 minutes to get to Universum® Bremen from the main railway station (stop: Universität/NW1). Alternatively, visitors can take tramline 8 (towards Kulenkampffallee) to the final stop and change to bus route 22 (towards Universität-Lehe / Spittaler Straße) to the Wiener Straße stop.